Lineage. Organized as 13 Aero Squadron on 14 Jun 1917. Demobilized on 29 Mar 1919. Reconstituted, and consolidated (16 Oct 1936) with 104 Aero Squadron, which was organized on 25 Aug 1917. Redesignated: 13 Squadron on 14 Mar 1921; 13 Attack Squadron on 25 Jan 1923. Inactivated on 27 Jun 1924. Activated on 1 Nov 1929. Redesignated: 13 Bombardment Squadron (Light) on 15 Sep 1939; 13 Bombardment Squadron (Dive) on 28 Sep 1942; 13 Bombardment Squadron (Light) on 25 May 1943; 13 Bombardment Squadron, Light, Night Intruder on 25 Jun 1951; 13 Bombardment Squadron, Tactical on 1 Oct 1955. Discontinued, and inactivated, on 15 Jan 1968. Activated on 8 Feb 1969. Redesignated 13 Fighter Squadron on 1 Jul 1973. Inactivated, and redesignated 13 Bombardment Squadron, Tactical, on 30 Sep 1973. Redesignated 13 Bomb Squadron on 1 May 2000. Activated on 14 Jun 2000. Assignments. Of 13 Aero Sq: Unkn, 14 Jun 1917-Jun 1918; 2 Pursuit Group, 28 Jun-Dec 1918; unkn, Dec 1918-29 Mar 1919. 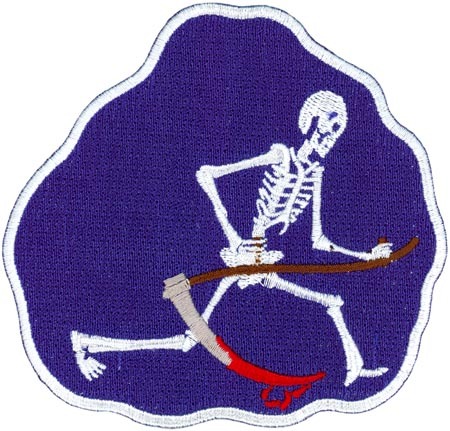 Of 104 Aero (later, 13 Attack) Sq: Unkn, 25 Aug 1917-Aug 1918; V Corps Observation Group, Aug Dec 1918; unkn, Dec 1918-30 Jun 1919; Army Surveillance (later, 1 Surveillance; 3 Attack) Group, 1 Jul 1919-27 Jun 1924. 3 Attack Group, 1 Nov 1929 consolidation. Aug-3 Nov 1964, 17 Feb-21 Jun 1965; 6252 Tactical Fighter Wing, 16 Aug-16 Oct 1965, 16 Dec 1965-17 Feb 1966; 35 Tactical Fighter Wing, 17 Apr-17 Jun 1966, 14 Aug-13 Oct 1966, 12 Dec 1966-11 Feb 1967, 11 Apr-8 Jun 1967, 1 Aug-26 Sep 1967, 21 Nov 1967-15 Jan 1968). 15 Tactical Fighter Wing, 8 Feb 1969; Pacific Air Forces, 15 Sep 1970 (attached to 8 Tactical Fighter Wing, 15 Sep-30 Oct 1970); 8 Tactical Fighter Wing, 31 Oct 1970; 405 Fighter Wing, c. 24 Dec 1972-30 Sep 1973. 7 Operations Group, 14 Jun 2000; 509 Operations Group, 9 Sep 2005-. Stations. Of 13 Aero Sq: Camp Kelly, TX, 14 Jun 1917; Wilbur Wright Field, OH, 8 Jul 1917; Garden City, NY, 1 Nov 3 Dec 1917; St Maixent, France, 1 Jan 1918; Issoudun, France, 27 Jan 1918 (detachment at Meucon, France, 6 Apr c. 11 May 1918, and Haussimont, France, c. 11 May c. 24 Jun 1918); Colombey les Belles, France, 5 Jun 1918; Tout, France, 28 Jun 1918; Belrain, France, 23 Sep 1918; Souilly, France, 23 Sep 1918; Colombey les Belles, France, 16 Dec 1918; port of embarkation, 6 Feb 3 Mar 1919; Garden City, NY, 13 29 Mar 1919. (flight operated from Barricourt, France, 10 Nov 1918 unkn); Belrain, France, 30 Nov 1918; Colombey les Belles, France, 14 Jan 1919; St Denis de Pile, France, 29 Jan 1919; Libourne, France, 3 Feb 1919; Bordeaux, France, 10 18 Apr 1919; Roosevelt Field, NY, c. 28 Apr 1919; Mitchel Field, NY, c. 1 May 1919; Ft Bliss, TX, c. 15 May 1919; Kelly Field, TX, Jun 1919; Ft Bliss, TX, 6 Nov 1919 (flight operated from Marfa, TX, c. 6 Nov 1919 3 Sep 1920; Post Field, OK, 10 Sep 4 Nov 1920; Marfa, TX, 17 Nov 1920 Jun 1921); Kelly Field, TX, 2 Jul 1921 27 Jun 1924. Langley Field, VA, 1 Nov 1929; Ft Crockett, TX, 17 Nov 1929; Barksdale Field, LA, 27 Feb 1935 consolidation. Of Consolidated Sq: Barksdale Field, LA, from consolidation; Savannah, GA, 10 Oct 1940 19 Jan 1942; Oakland, CA, 23 31 Jan 1942; Brisbane, Australia, 25 Feb 1942; Charters Towers, Australia, 10 Mar 1942 (detachment operated from Del Monte, Mindanao, 12 14 Apr 1942); Port Moresby, New Guinea, 3 Nov 1942; Charters Towers, Australia, 25 Nov 1942; Port Moresby, New Guinea, 16 Dec 1942; Dobodura, New Guinea, 22 May 1943; Nadzab, New Guinea, 1 Feb 1944; Hollandia, New Guinea, c. 21 May 1944; Dulag, Leyte, 20 Nov 1944; San Jose, Mindoro, 30 Dec 1944; Okinawa, c. 7 Aug 1945; Atsugi, Japan, c. 10 Oct 1945; Yokota AFB (later, AB), Japan, 1 Sep 1946; Johnson AB, Japan, 10 Mar 1950; Iwakuni, Japan, 2 Jul 1950 (temporary); Johnson AB, Japan, c. 20 Jul 1950; Yokota AB, Japan, 14 Aug 1950; Iwakuni, AB, Japan, 1 Dec 1950; Kunsan, Korea, 13 Aug 1951; Johnson AB, Japan, 1 Oct 1954; Yokota AB, Japan, 17 Nov 1960; Clark AB, Philippines, 10 Apr 1964 15 Jan 1968 (deployed at Bien Hoa AB, South Vietnam, 5 Aug 3 Nov 1964, 17 Feb 16 May 1965; Tan Son Nhut AB, South Vietnam, 16 May 21 Jun 1965; Da Nang AB, South Vietnam, 16 Aug 16 Oct 1965, 16 Dec 1965 17 Feb 1966, 17 Apr 17 Jun 1966 [operated from Bien Hoa AB, South Vietnam, 15 22 May 1966], 14 Aug 9 Oct 1966; Phan Rang AB, South Vietnam, 10 13 Oct 1966, 12 Dec 1966 11 Feb 1967, 11 Apr 8 Jun 1967, 1 Aug-26 Sep 1967, 21 Nov 1967 15 Jan 1968). MacDill AFB, FL, 8 Feb 1969 15 Sep 1970; Ubon RTAFB, Thailand, 15 Sep 1970; Clark AB, Philippines, c. 24 Dec 1972 30 Sep 1973. Dyess AFB, TX, 14 Jun 2000; Whiteman AFB, MO, 3 Jun 2005-. Aircraft. Of 13 Aero Sq: Spad XIII, 1918. Of 104 Aero (later, 13 Attack) Sq: Salmson 2, 1918; DH 4, 1919 1922, 1923 1924; XB 1A, 1921 1922; GAX (GA 1), 1922 1923. A 3, 1929 1934; A 12, 1934 1936; A 17, 1936. Of Consolidated Sq: A 17, 1936 1939; B 12, B 18, 1939 1941; A 20, 1941, 1944 1945; B 25, 1942 1944, A (later B) 26, 1945 1956; B 57, 1956 1968. B 57, 1969 1972. B-1, 2000-2005; B-2, 2005-. Operations. Of 13 Aero Sq: Combat as pursuit unit, c. 20 Jul 10 Nov 1918. Of 104 Aero (later, 13 Attack) Sq: Combat as corps observation unit, 12 Sep 10 Nov 1918. Mexican border patrol, Nov 1919 Jun 1921. Of Consolidated Sq: Combat operations in Southwest Pacific and Western Pacific, 6 Apr 1942 12 Aug 1945. Combat operations in Korea, 28 Jun 1950 27 Jul 1953. Rotating deployed crews flew combat operations in Southeast Asia, May 1964 15 Jan 1968. Combat in Southeast Asia, 17 Oct 1970 10 Apr 1972. Deployed personnel and aircraft to Afghanistan in early 2002 before returning to the US as the executive agent for the support of the B-1 test program. Deployed personnel and equipment again to Guam in 2003 to support Operation Iraqi Freedom and in 2004 to Afghanistan. In Jun 2005, the 13th moved to Whiteman AFB, MO and replaced the 325th Bomb Squadron and changed to B-2 aircraft. Deployed temporarily to Andersen AFB, Guam in Jun 2006 to assist U. S. Pacific Command in maintaining stability and security for the Asiatic-Pacific region. Campaign Streamers. World War I: St Mihiel; Meuse Argonne; Lorraine. World War II: Antisubmarine, American Theater; Philippine Islands; East Indies; Papua; Bismarck Archipelago; New Guinea; Leyte; Luzon; Southern Philippines; Western Pacific; Air Offensive, Japan. Korean War: UN Defensive; UN Offensive; CCF Intervention; 1st UN Counteroffensive; CCF Spring Offensive; UN Summer Fall Offensive; Second Korean Winter; Korea, Summer Fall 1952; Third Korean Winter; Korea, Summer 1953. Vietnam: Vietnam Advisory; Vietnam Defensive; Vietnam Air; Vietnam Air Offensive; Vietnam Air Offensive, Phase II; Southwest Monsoon; Commando Hunt V; Commando Hunt VI; Commando Hunt VII; Vietnam Ceasefire. Decorations. Distinguished Unit Citations: Philippine Islands, [12 14 Apr] 1942; Philippine Islands, 11 14 Apr 1942; Papua, 23 Jul 1942 23 Jan 1943; New Guinea, 17 Aug 1943; Korea, 27 Jun 31 Jul 1950; Korea, 22 Apr 8 Jul 1951; Korea, 1 May 27 Jun 1953. Presidential Unit Citations (Southeast Asia): 10 Oct 1966 10 Apr 1967; 6 Jun 1967 18 Jan 1968; 1 Jan 1 Apr 1971. Air Force Outstanding Unit Awards with the Combat “V” Device: 19 Feb 1965 19 Feb 1966; 15 Sep 31 Dec 1970; 1 Oct 1971 31 Mar 1972. Meritorious Unit Awards: 1 Jun 2005-31 May 2007; 1 Jun 2007-31 May 2008. Air Force Outstanding Unit Awards: 1 Jun 1958 30 Jun 1960; 1 Jul 1960 31 Mar 1962; 5 Aug 1964 31 Mar 1965; 8 Feb 31 Dec 1969; 1 Jun 2002-31 May 2004. Philippine Presidential Unit Citation (WWII). Republic of Korea Presidential Unit Citation: 27 Jun 31 Jul 1950. Republic of Vietnam Gallantry Cross with Palm: 1 Apr 1966 9 Feb 1967 and [28 Sep] 1970 24 Dec 1972. Emblem. Approved on 14 Feb 1924.